« It’s Race Day At Pocono! With such a long stretch of green flag racing in the first half of the race, I’m not sure how the production looked on television. What I can say is that from my vantage point, it seemed that they were running on the ragged edge. Being live at the track gives you more of a sense of speed than watching on the couch at home and you just have the sense that the drivers are only a wiggle away from stuffing a car into the fence. But the second half of the race, with the aid of a few restarts, ended up being very exciting. 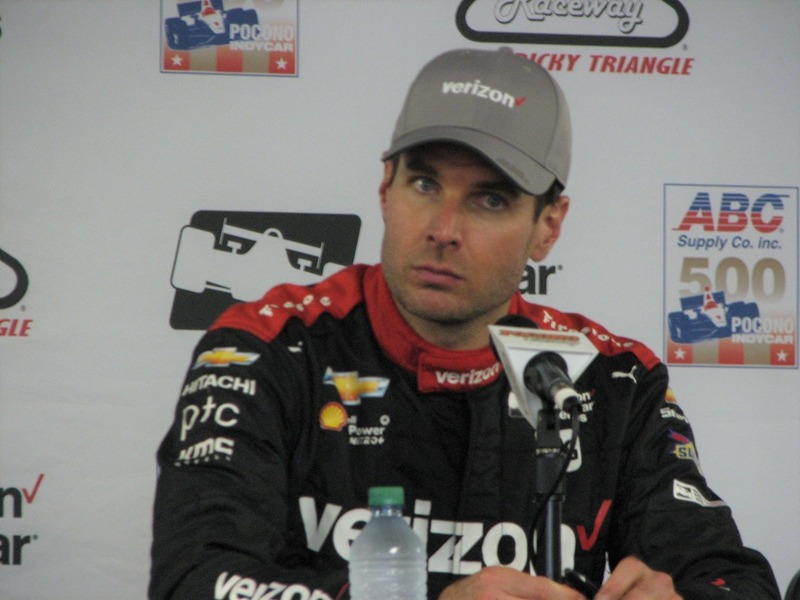 With about twenty-five laps remaining, Will Power had a commanding lead. But after the last pit stops sorted things out, Josef Newgarden started his charge. At the end, it was Will Power holding off the charging Newgarden for the win. From my viewpoint, had Newgarden had a couple of more laps – I think he would have gotten him. But we’ll never know. There were a couple of mishaps. First, Sebastian Saavedra glanced off of the Turn One wall on Lap 116 and slid all of the way down almost to Turn Two – where I was located. Then on Lap 125, James Hinchcliffe went up into the back-end of JR Hildebrand. They both went into the wall backwards, but Hinch was more of a direct hit while Hildebrand’s hit was more of a glancing blow. I was all the way down in Turn Two. I saw the impact and due to the distance involved, I heard the “thud” a couple of seconds later. Once Power got his lap back after changing a rear wing, he said in the post-race press conference that it was “game-on”. After seeing his lead once he got out front, it looked like he could coast. But Newgarden looked determined to win his third race in a row. But Power was just as determined to win his second in a row at Pocono Raceway. He said he did all he could do to make sure Newgarden couldn’t pass him into Turn Three. I’ll be honest – when Power went a lap down, I didn’t think there was any way in the world that he could win this race. But Power makes a habit of facing major adversity in races and turning it into race wins. Power is now only forty-two pints back in the points race with three races to go, with one of them being a double-points race. There are now five drivers with a legitimate shot to win the championship, now that Power has joined them. It should be a very exciting three races. So now, it’s on to Gateway – just across the river from St. Louis. Susan will be joining me at that egg-shaped oval that IndyCar has not raced on since 2003, when Helio Castroneves climbed the fences. There is still a handful of drivers that have raced there, but it could prove to be the wild card in the points battle. That will do it for me for today. Tomorrow, I will have my usual “Random Thoughts” article – although it may be a little abbreviated than usual. Thanks to everyone who followed along with me this weekend. This entry was posted on August 20, 2017 at 5:46 pm and is filed under IndyCar. You can follow any responses to this entry through the RSS 2.0 feed. You can leave a response, or trackback from your own site. That was an absolutely magnificent motor race. I’m thrilled that you and Paul were able to be there to see it in person. Thanks for all your coverage George. I thought it was a great race and especially those last 20 laps or so. I was hoping Joseph would catch him but will was very clever. The crowd look better than when I was there in 2015. I hope it was a success for the promoters. I am very jealous that you and Paul were able to have a pace car lap around the track. I have to agree. That was one hell of a race. Competitive, natural, hard-nosed racing. Loved every minute at the track. Those pace cars had a nice growl as they drove by the start finish line. Can’t wait to go back next year. Will drove a great race. When I saw him go a lap down, I thought his title chances were over. It was great seeing RHR take the lead. Definitely a fan favorite after what happened in qualifying. Thanks again George! It was a great race all day. And it looked good on tv. Can’t imagine anyone complain on this dace. How was the view from Turn 2 as opposed to the grandstands? I only ever see GA tickets for the main stretch. I couldn’t understand that Sebastian Saavedra brushed against the wall and came to a stop, For what seemed like a non crash event, I understood when they went to Yellow, but it took more laps to go back to green on Sebastian incident than for the two car crash with James Hincliffe and JR Hildebrand. Its just ridiculous to have a 6 lap yellow.